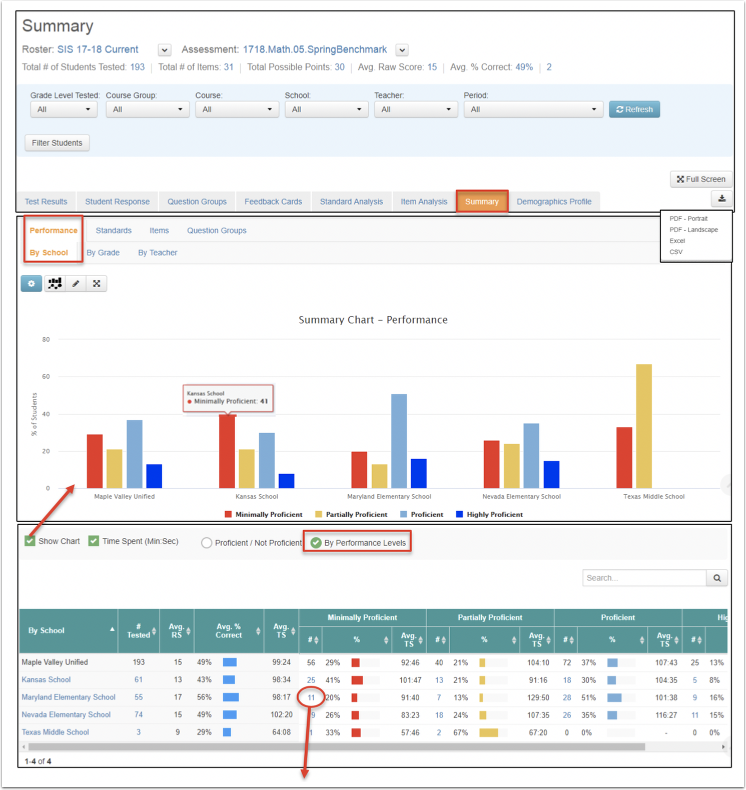 Once assessment results have been uploaded into SchoolCity Suite, either by scanning, GradeCam™, or online administration, the data can be viewed in a variety of ways. 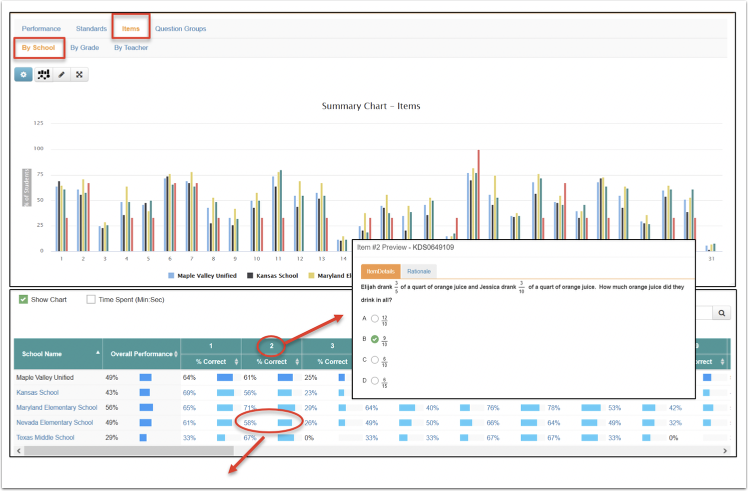 One of the Predefined Reports in SchoolCity SUITE is the Summary Report which displays summary data for the selected assessment by School, Grade, Teacher, Class, Standard, and Item depending on the User role. 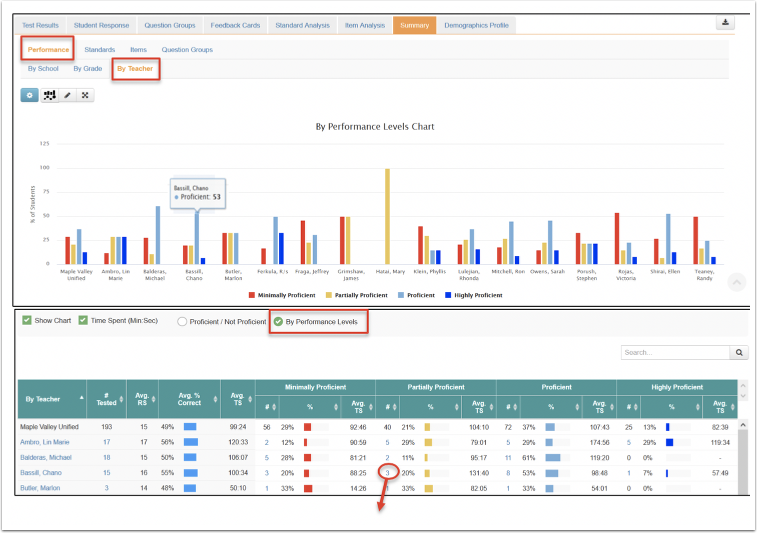 The default setting shows the list of Predefined Reports under the orange tab (1b). Click on the Summary name in blue or on the view icon (eye) to the far right to go to the Summary Report (1c). Note the descriptor statement for this report. Or, from the Launchpad, click on the REPORTS flip card. On the flipped side, select Predefined Reports, then click on the right arrows to scroll to the last card. Select Summary to go to the report. Search Filters: Search filter types depend on User role. Click Refresh to view results. Filter Students: Filter results by student or demographic group. Full Screen: Click here to view report in full screen mode. 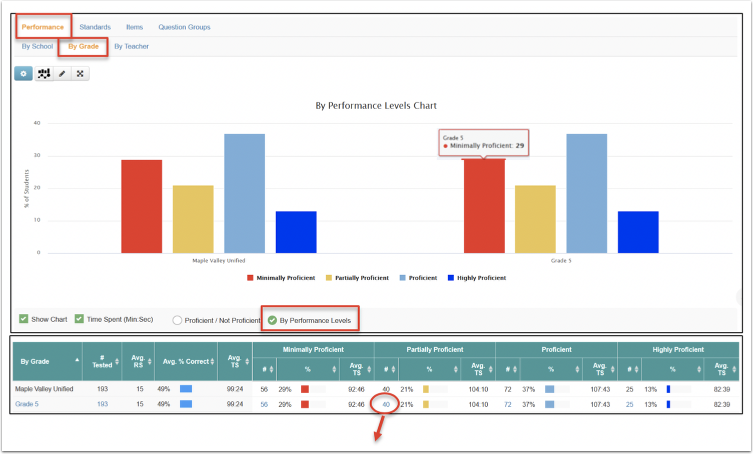 Show Chart: Check the box to show the chart, uncheck to hide the chart. Hover over any column to view more details. Time Spent (optional): View the average time spent on the assessment. By Performance Level: Depending on the district, assessment results may be viewed in one or both of these options by Proficient/Not Proficient and By Performance Level. Search Box: Enter specific school, grade, or teacher when in appropriate view, then click on the magnifying glass icon to view results. View student results: Click on any number in blue font to view a detailed list of students in that performance level. Note that this view may be exported to PDF, Excel, or CSV. Create Group: Create a student group for re-teaching and reassessing. Please see the Help document, Groups: Creating a Student Group, for more information. Exit Full Screen: Click on Exit Full Screen on orange to return to the full report. Results: School Name, Total Number of Students Tested, Average Raw Score (RS), Average % Correct (blue bar), Average Time Spent (TS) (optional), Proficient (green bar) /Not Proficient (red bar) each with Number of Students, % of Students, Average TS. View Student Results: Click on any number representing students to view a detailed list of the students in that group. Student groups may be created from this view. This view may be exported to PDF, Excel, or CSV. Note: Proficient/Not Proficient is determined by the proficiency level of the Performance Level set applied to the assessment during the creation process. Results: Grade Level, Number of Students Tested, Average Raw Score (RS), Average Percent Correct (blue bar), Average Time Spent (TS) (optional), Performance Levels indicating # Students who scored in that level, Average % Correct, and Average TS. View Student Results: Click on any number representing students to view a detailed list of the students in that performance level. Student groups may be created from this view. This view may be exported to PDF, Excel, or CSV. Results: Teacher Name, Number of Students Tested, Average Raw Score (RS), Average Percent Correct (blue bar), Average Time Spent (TS) (optional), Performance Levels indicating # Students who scored in that level, Average % Correct, and Average TS. View student results: Click on any percentage in blue font to view a detailed list of student results. Student groups may be created from this view. Note that this view may be exported to PDF, Excel, or CSV. Mastered/Not Mastered: Percent Correct results are shown as Mastered (green outline) or Not Mastered (red outline), based on the Standards Mastery Percentage set in District Defaults or My Preferences. Results: School Name, Overall Performance (Average Percent Correct and blue bar graph), Average % Correct for each item. Note Time Spent has been hidden. Preview the item by clicking on the item number (depending on assessment type and test security measures that may be in place). 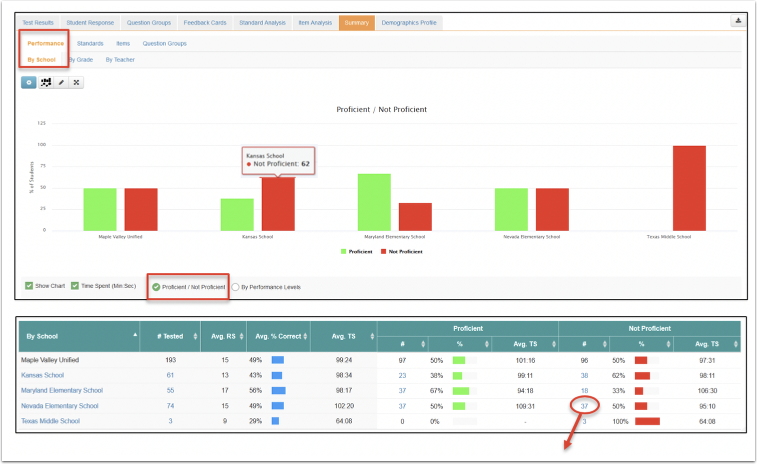 View student results: Click on any percentage in blue font or light blue bar graph to view the item and a detailed list of students. Click on the tabs, Correct / Partially Correct / InCorrect to view that group of students. Chart Settings: Click on the gear icon in the blue box to change the chart settings. Select a chart type as pictured. Column is the default chart for the report. View the new chart in the Chart Preview. 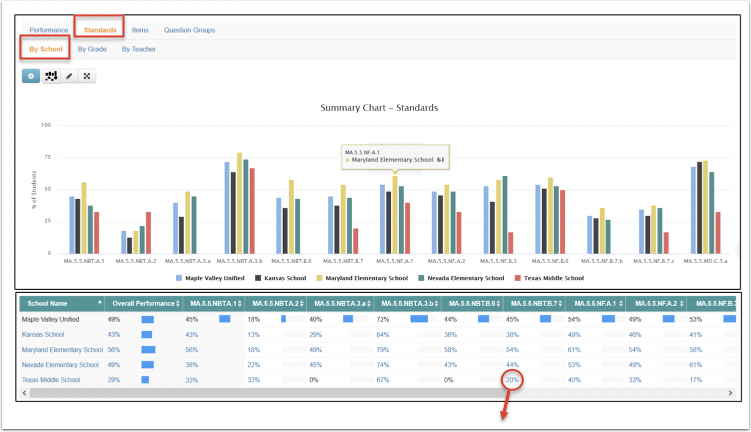 Change the Display Options as desired show percent of students and/or numbers of students in the chart. Click on Update Chart to save your selections. Click Return to Report to close the Chart Settings window. Edit Chart Labels: Click on the Edit icon to change the Chart labels. Change the Chart Title and Y-Axis labels. Click Apply to view changes in the chart. Chart Full Screen: Click on the Full Screen icon to view the chart in full screen mode. Download the chart in four ways.